Well with a little breather between events in the Lost world, I decided to have a look at the old in tray to see if there was anything cool I'd missed from Comic Con. Sure enough, I had overlooked the auction that had been announced a short while ago of Lost props. 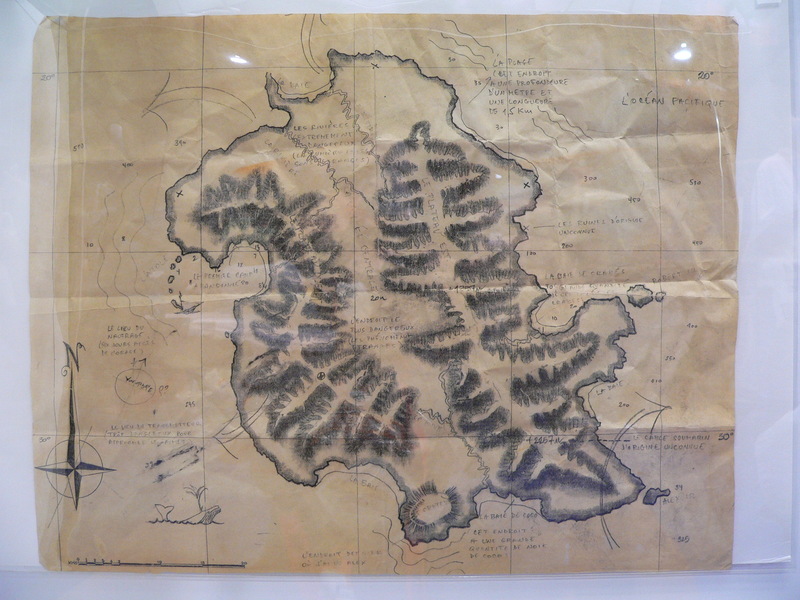 At Comic Con, there had been a preview of said items, and I noticed one little gem, the full Island map of Rousseau's. Though Rousseau's map had been seen before, never fully in one view, and never had all the French annotations been completely translated. Luckily for us, famed Lost fan Ryan Ozawa photographed the map and posted it online. Next up, I used some of the annotations we already had from Lostpedian Zholmboc, as well as from our page on the maps. Then, using the help of DarkUFO's chat crew, we carefully went through making amendments and solving lots of stuff that had never been seen before on previous screencaps of the map. A big thanks to Fivebretz, Jamielost, Elize34, Jeetus, KeepingPace, Chalovak, NewP and many others for all the help and eye-squinting at illegible French! Finally, we all came to agreement with our interpretations. Click below for the full image. Let us know what you think - some areas like the bit about crustaceous crabs, where I saw Alex, and the magnetic north equation are highly subjective, and if anyone can get a better translation of it somehow, use the original image (or inverted) and let us know what you come up with so we can make amendments! For some of you though, this might be the first time you've seen an official drawing of the Lost Island. We hope you enjoy! And, once again, thanks to all the people who without whom this little project wouldn't have been completed. HAVING A LITTLE TROUBLE WITH THE IMAGE LINKING TO FULL SIZE -- USE THIS DIRECT LINK!